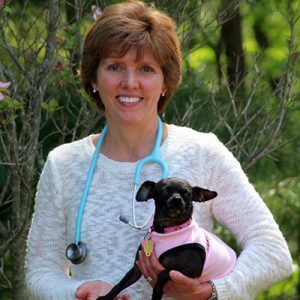 Dr. Joyce Koch is a 1991 graduate of the University of Pennsylvania, School of Veterinary Medicine. She has been serving the South Jersey community as a small animal veterinarian ever since. Dr Koch says she can’t ever remember wanting to be anything other than a veterinarian. Even in first grade, she brought home and cared for an injured turtle. Starting at age 14 she rode her bike to work at a professional kennel. Her previous work experience includes being a veterinary technician as well as summer experience on a dairy farm. Her co-workers describe her as a caring, hands-on animal doctor who has a compassionate bedside manner. Over the years, Dr. Koch’s household has been home to rescue dogs, cats, birds, fish and even snakes – so far. Many of the animals have accompanied her when she participates in career days and visits her sons’ schools. In addition to being a member of the American Veterinary Medical Association, Dr Koch has been active in the local professional organizations, the Southern New Jersey Veterinary Medical Association (SNJVMA) as well as the New Jersey Veterinary Medical Association (NJVMA). She has held several offices including serving as President of the SNJVMA, served on the NJVMA Executive board for several years and was an active member of the Ethics and Grievance Committee. Dr Koch is a past recipient of the South Jersey Veterinarian of the Year Award and the Robert Shomer VMD Veterinary Service Award. Although Dr. Koch has been in practice for twenty years, being part of Dr. Lisa’s Mobile Veterinary Service has provided her with a unique opportunity to really feel like she is becoming part of the pets’ family. By getting to know the pets’ owners and their environment, Dr. Koch feels she can provide even better medical care and advice for long-term wellness and a healthy, happy life.